On one of my photo walks a couple weeks ago I found myself UNDER a nearby bridge. No I am not a troll although I did like the book “Three Billy Goats Gruff” when I was little but I digress. So I was visiting a nearby nature preserve and on the way back to the parking lot I found a path that lead me under the bridge. Once under the bridge I couldn’t help but look for the possibilities with all these photo themes swimming around in my head. My next thought was that this would fit perfectly in the “Repeating Patterns” theme! 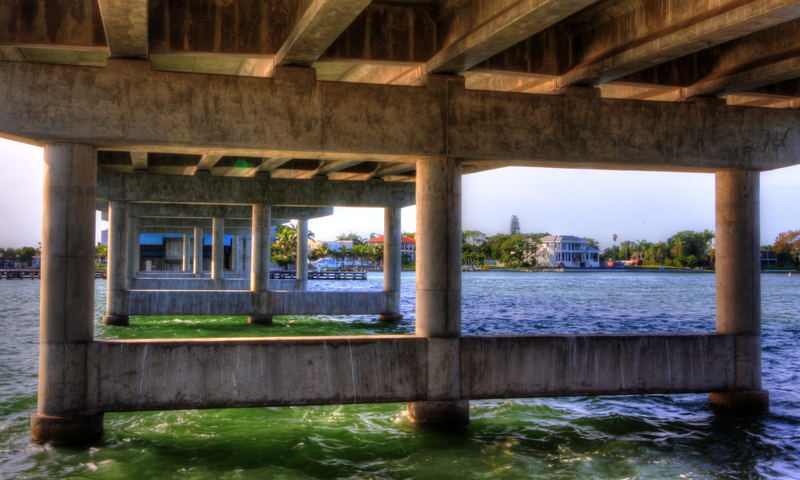 Categories: Canon 5D Mark II, HDR Photography, Nature Preserves, Photography, Uncategorized | Tags: 52 Week Photo Challenge, Canon 5D Mark II, Mindy Towns Photography, nature preserves, Photography, sarasota bridge | Permalink. What an eye. That is really good. As usual, I’m very impressed by your photography. I really like this photo – you do see what a lot of others dont! You, under a bridge?!?! 🙂 Great photo Mindy! I recognize this bridge! You were by my real estate office on Longboat Key, weren’t you? Yep! It was the day Melody and I went spider hunting! I also like the frame you created for the big house on the right. Thanks Liz! Wish I could say that was on purpose! Nice shot…good eye to catch this one. Were you collecting seaweed? No Joanna, I was visiting a little nature preserve on Longboat Key just across the bridge from Lido Key. I am having so much fun visiting all these little out of the way places with my camera! Great composition. It’s all about keeping a clear mind and noticing what’s really around you.